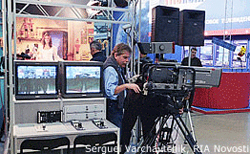 Television remains the biggest news source for Russians but has become less trusted over the past decade, according to a new poll published by the independent Levada Center. Seventy-three percent of respondents told Levada that they get their news from television, down from 85 percent this spring. Online news outlets were the main news source for 37 percent of respondents, up from 27 percent in March. “Social networks and the internet continue to strengthen their position among information channels that the population uses to receive news,” Levada wrote on Thursday. Almost half of the respondents told the pollster that they trust television news, versus almost a quarter who said they find online publications trustworthy. Since 2009, the pollster said trust in television news dropped from 79 percent to 49 percent. Conversely, online publications gained in trustworthiness from 7 percent in 2009 to 24 percent in 2018. Observers say that younger populations view online outlets as being more trustworthy, while the older working-age population has recently found itself at odds with state television’s efforts to drum up support for unpopular government moves to raise the retirement age. “The way the pension reform was characterized on the screen came into conflict with their personal interpretation,” Alexei Makarkin, the deputy head of the Moscow-based Center for Political Technologies think tank, told the Vedomosti business daily. Levada’s survey was conducted among 1,600 respondents in 52 Russian regions between Aug. 23 and Aug. 30.